We have used these rules twice now; the first was a game based on the Battle of Saalfeld, 10th October 1806 and the second on the Battle of Bailén, 19th July 1808. Both of these are moderate sized battles involving opposing armies equivalent to about a corps in strength. They are also both battles that 'developed' with the defending Prusso-Saxon and Spanish armies respectively pitched against a French 'army' arriving over the course of the battle. This was not done intentionally, but probably makes for a better test of a set of rules than does a set piece battle. Sometimes we are able to tell immediately that a set of rules is not for us. Occasionally they do not seem ‘right’ upon reading. If a set has something to offer we’d generally aim for at least two test games to evaluate them fully. This was the case with GdD which gave us one impression after the first test-game and quite another after the second. As with all of the sets of rules in the Baccus/Polemos "stable", General de Division (GdD) are designed specifically for 6 mm figures, with, in this case, units representing around 500 to 1 000 combatants; i.e. a battalion or regiment of infantry or a regiment or brigade of cavalry. The book incorporates two related, complimentary, but subtly different sets of rules for corps/army (Marechal de l'Empire) and corps/division (General de Division) scale games. The rule book itself is nicely produced, well written with generally clear examples and, as a bonus, a couple of scenarios for games based on historical battles. The concept of ‘tempo’ is at the heart of both sets of rules. Tempo is an innovative system which combines ideas of initiative and PIPs into a novel and workable system to manage command and control plus movement sequence on the tabletop. Each side gets a number of ‘tempo’ points based on a die roll and number of subordinates. They ‘bid’ with part of their allocation to win the initiative for the turn, the remainder being available to send to subordinates who then convert them to ‘orders’ to get higher level formations or individual units to perform actions. On face value tempo is solely about command and control, but is actually the process by which GdD controls time. While stylised, it is reasonable as a means of managing the timing of events on the table, but there remains the need to ‘prompt’ a formation to move which we, particularly Mark, found frustrating. We could understand needing to get orders to a formation but, once on the way, it seemed somewhat ridiculous to have to ‘prompt’ everything each turn. The measurement of ground scale in GdD (and MdE) is quite brilliant. Units are based on stands of base width (BW) x base depth (BD)—obviously! The brilliance is that a BD is 1/2 BW. All movement and ranges are given in terms of BW, meaning that a single measuring stick in increments of BW (including a half BW) is sufficient for everything, ranges and movement are easy to work out and, I daresay, to memorise after a few times using the rules. Unit quality is covered simply by four levels of training; raw, trained, veteran and élite. Skirmishers are included simply as a skirmish factor for each unit. Tempo points are converted into ‘orders’ based on a commander's rank and capability (decisive, capable, plodding). The combat system is a bit of a mixed bag. The artillery bombardment rules seemed bizarre as the most likely results were either a miss or causing the battery to cease firing. The firefight/mêlée combat system seemed somewhat cumbersome when you read it, due to the multiple steps, but appeared to play quite well. ‘Casualties’ are taken as ‘shaken’ levels, three ‘shaken’ levels causing a unit to break. Higher level morale is covered and brigades/divisions rapidly became ‘spent’ once a few units are ‘shaken’ or ‘broken’. So, after the first use of GdD for our first Saalfeld game we were left with the impression that, while not the ideal ‘horse’ for our ‘course’, they played pretty well and were worth another go. Our impression of the rules diminished after our second play-test, which involved all three members of the ANF. Our second play-test of GdD, for a game based on the Battle of Bailén, highlighted the fact that they are derived from Baccus’/Polemos’ original rules for the War of Spanish Succession and retain a strong C18th flavour (an aspect that Julian picked up straight away). 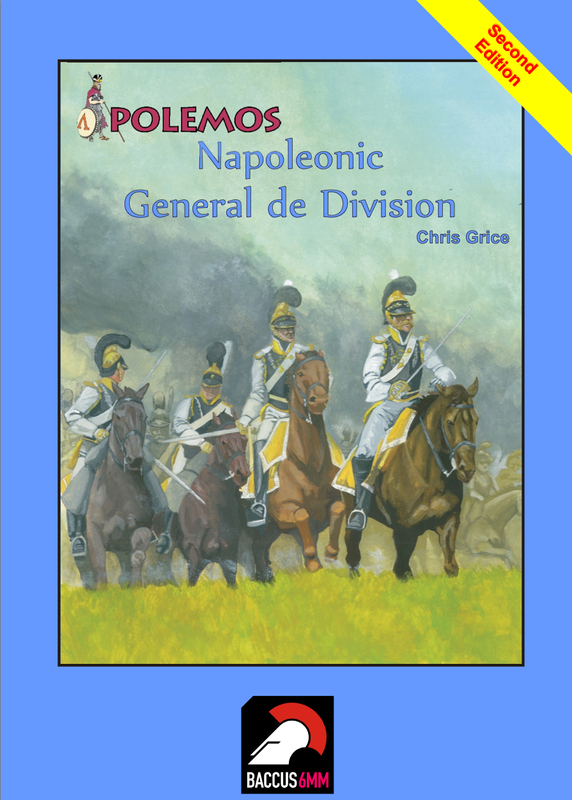 The introduction to the Polemos Great Northern War rules (published 2005) says "it relies very heavily on the excellent work done so far in other rules in the series, in particular the War of Spanish Succession rules." Chris Grice, the author of the Polemos’ War of Spanish Succession rules also wrote GdD and MdE, which were published in 2006. This ‘heritage’ of the rules is evident in several aspects; the ineffectual artillery bombardment, the ability of infantry in line to drive off cavalry (and this being the best tactic! ), the fact that squares are not represented per se but as part of combat resolution, even, the constant ‘prompting’ aspect of the tempo system. In addition, the ‘fast play’ nature of the rules became evident as commands rapidly became ‘spent’ once a unit or two was shaken and/or broken resulting in no ebb and flow of combat in the game. Further considering the ineffectual artillery bombardment rules Mark and I postulated that it is in part because the rules mechanism for casualties backs them into a corner. If bombardment was more effective and produced a single ‘shaken level’ result with a lower die roll, then the best die roll result would need to cause two, or even three shaken levels. If that happened, units would be destroyed by one artillery fire and so an entire command could be broken in a single bombardment—thus entering the realms of Grand Battery! Rules such as Shako get around this as (most often) only one casualty at a time (and/or a stagger) is inflicted in a single artillery fire, but you tend to inflict casualties more often, so you get a slow wearing down of battalions under fire over a few hours. This to us “makes sense" and certainly makes for a more enjoyable game, IMHO. We think that GdD are a reasonable set of rules, but not appropriate for Napoleonics. Admittedly we were taking them beyond their intended figure scale but our reasons are due to mechanisms rather than scale. We won’t be using GdD again but we are looking forward to using the Polemos Great Northern War rules when we do some games of that period—after 2015! That's a very good assessment and well tested. Thanks for posting it. A thorough, well argued review. Nice work. Nice review! Well done chaps. Thanks for the review! I don't see any reason why the size of figures used should matter, as all measurements are in BW anyway. However, it does seem likely that the fact that they are intended for 6mm, fast play means that a Corps is probably a rather small amount of troops for the game, and the focus must be on the "Big Picture". That is inevitably going to mean some com[promises. Overall, I suspect you'd prefer Snappy Nappy for games aimed at this level. For more tactical games, other rules (like Shako2, Field,of Battle, etc) would be more likely to give you the feel that you are looking for. Still, almost every rules set that I try gives me some ideas and/or inspiration for rules concepts! The presence of at least one ready made scenario is always a welcome plus! Thanks gents. Nice to know that someone reads this stuff! Peter, it's not quite as you surmise since GdD is their corps level set. MdE is their one for big actions. Of course we have quite happily used Shako for games from about 20 000 to 200 000 combatants, as you mob have with Field of Battle! I am finishing off the report of Bailén which I think will give you a better idea of how they played. It was the 'deal breaker' for us (for Napoleonics).